This is a very well documented and scholarly presentation. It contains a lively debate concerning certain important and controversial matters of history and of the authorship of the Sanskrit works written during the Vijayanagar era. Adducing both internal and external evidence the author makes out a convincing case for the Telugu origin of the founders of the Vijayanagar empire. On this and on many other issues, the author has of course to cross swords with scholars. But he shows both courage and conviction in refuting their views. The book also provides helpful analyses of the works of Sayana and Madhava-Vidyaranya. The review of Vidyaraya's Contribution to Advaita, in chapter viii, is lucid and knowledgeable, and shows a sure grasp of the philosophical subtleties involved. All in all, this is an extremely useful book; it sheds much light on the historical and intellectual mileau of a glorious epoch in the annals of South India. Born at Cherloyadavalli, Atmakur Tq. Nellore Dt. (A.P.P in 1926. Prosecuted Oriental Studies in K.L.N. Sanskrit College, Tenali. Guntur Dt. And received Sahitya Vidyapraveena, a qualification in advanced Sanskrit, from Andhra University in 1952. Taught as lecturer in Sanskrit in Oriental College of Sri Saradaniketanam, Guntur, for over thirty years. Done B. A. (Hons.) with Sanskrit main at Andhra University during 1958-61 and received M. A. Degree in 1962. First candidate to receive the award of Ph.D. Degree in Sanskrit among the Oriental Colleges of the State. Member of the Board of Studies, Nagarjuna University. 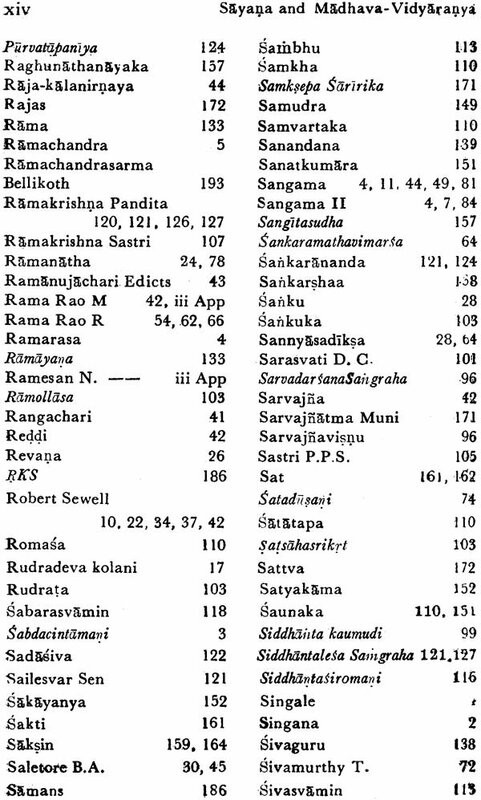 Published works include Krsnayajurvediya Sandhyavandanam (Brahmayajna Nityatarpana Sahitam) 1970 and Diksitanvaya Muktavali 1974. Continuing Post doctoral research at Adyar Library and research centre, Madras. I have great pleasure in writing a foreword to this study on Sayana and Madhava-Vidyaranya a Ph. D. Thesis of the Karnatak university, Dharwar, prepared under the direction of prof. K. Krishnamoorthy, by friend and a student of prof. C. Kunhun Raja, r. M. Kripacharyayulu. The author has examined the available material literary and epigraphical con the various problems connected with Sayana and Madhava-Vidyaranya before coming to his conclusions. This is divided into two parts, containing ten chapters. Part one is devoted to the lives of the two brothers, Sayana and Madhava, The historical background of the Vijayanara empire and the contribution of the rulers to the revival of Hindu religion and culture are discussed in detail. He supports the view that Harihara and Bukka were the real founder of the Vijayanagara empire. He refutes B.A.Saletore's view about Sayana and Madhava and their patrons Harihara and Bukka being karnatakas and is convinced that they belonged to Andhra. He refutes T.M.P. 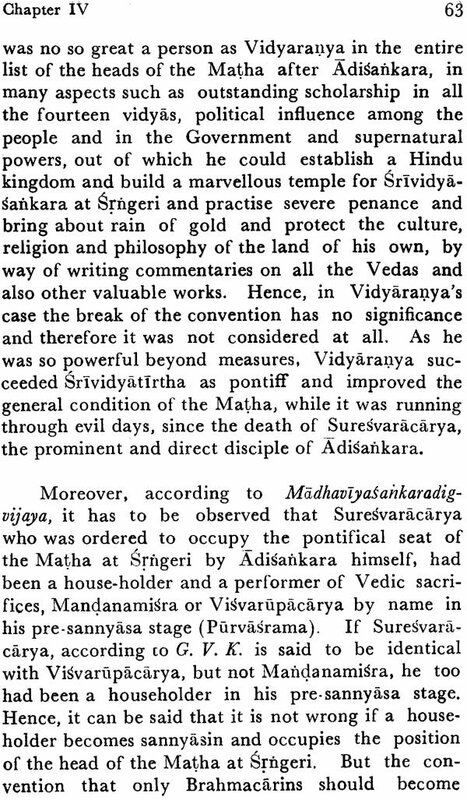 Mahadevan's view about the identity of Bharatitirtha and Vidyaranya and proves that Sankkarananda and Sri Vidyatirtha are identical. He considers that it was Madhava who took to Sannyasa under the name of Vidyaranya and the that Bharatitirtha was his teacher. He assigns to Madhava-Vidyaranya the two basic texts Pancadasi and Vivaranaprameya Samgraha and rejects the view of the editors of the work, Sailesvar Sen and others. The works of Sayana and Madhava are discussed in separate chapters in part II. There is a special chapter on Vidyaranya's contribution to Advaita philosophy wherein the important concepts of Maya etc. are dealt with. 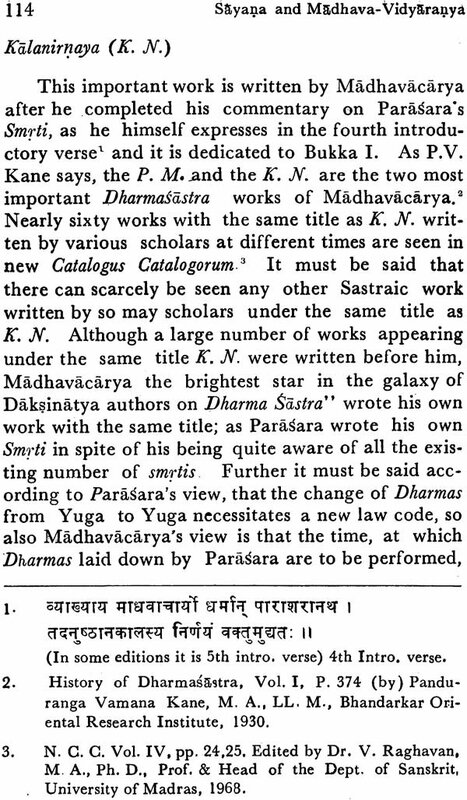 The author explains the editorship and other particulars regarding Bhasyas on Vedic texts: Samhitas and Brahmanas in the tenth chapters. Here is a very useful and comprehensive survey of the life and works of Sayana and Madhava-Vidyaranya, likely to inspire serious scholars to enter the field with confidence. I am sure that it will be welcomed by scholars and the general public interested in Indian culture. When I proposed this subject my guide Prof. K. Krishnamoorthy stared at me and said, "how can you take it? It is too vast." I replied, "yet I want to take the subject, sir," "Then what are your special studies for choosing this; other than what you did for the exam"? he enquired of me. I replied: "as far as Vyakarana is concerned I studied Praudhamanorama with Sabdaratna, a commentary (upto Kaakanta), Paribhasendusekhara (upto Antaranga Paribhasa), and Mahabhasya (only Paspasahnika); regarding Vedanta I studied Advaita Paribhasa, some upanisads viz. Isa, Kena Prasna, Taittiriya and Svetasvatara and Bhagavadgita with Sankarabhasya; inrespect Veda I got byheart some portions like Rudradhyaya, Citti Prasna Mahanarayanopanisad Taittiriyopanisad; MahaSaura and I studied about ten Suktas in Rgveda with Sayanabhasya, further, I have obtained the initiation of Pancadasi in my sixteenth year; so I had acquainted myself with Mantra Sastra also. And as regards History I taught some students Indian history." With this information the professor was satisfiedand gave me a letter to Dr. M. Rama Rao, Retd. Professor of History, to provide me with some bibliography on the subject – "Sayana and Madhava-Vidyaranya: A Study of their lives and letter", as it has great historical importance. After going through the letter Dr. Rama Rao said " This subject is too vast and full of controversies. Several candidates may do research for their Ph. D. Degrees on this subject. Any way you have chosen this. Try your luck. I shall give you some bibliography, please come tomorrow." I thanked him for his kind and favourable response. The next day he gave me a few names of the books which paved my way in due course, to get through a large number of historical works and inscriptions, though they demanded much concentration strenuous effort and large amounts of money, from me for some years. However, I found the solutions for all the problems and completed the historical background and also I dealt with their monumental works including Vedabhasyas. Madhavacarya-Vidyaranya and his brother Sayanacarya, who were the celebrated commentators of all vedas and prolific writers on almost all branches of Vedic religion and Advaita philosophy and great politicians served as Prime Ministers under the early kings viz. Harihara. Bukka and others for a long time in the city and empire of Vijayanagara from its initial stage.' Since their political and literary activities are equally noteworthy this thesis is scrupulously divided into two equal parts containing five chapters each. The first part dealing with the historical back- ground is based on a study of the historical works including epigraphs, introductions and colophons of the works written by them as well as by the subsequent writers. Even the historical works can be divided into two classes cultural and political. 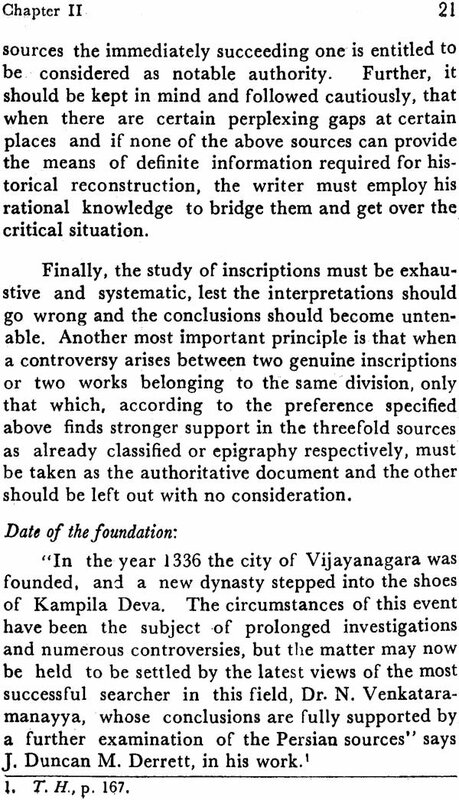 In the historical works of political interest, A Forgotten Empire, Sources of Vijayanagara History etc., there are only some sporadic references to Sayana and Madhava- Vidyaranya. In the second type of sources Vidyaranyavrtta nta, Keladinrpavijaya etc. are often mutually contradictory regarding incidents of their lives. Among modern works, only two, Sri VidyaraI.lya-Madhavad1ryacarita and Acarya Sayan aur Madhav, deserve mention here. The former is a Telugu work and deals with the subject both historically and mythologically and attributes the role of Madhavarnantrin to Madhavacary a Vidyaranya and also gives an alphabetical list of ninety five works attributed to him most of which are now known to be apocriphal. Moreover, this author V. V. Sivavadhani invokes tradition for the total number of Vidyaranyas works being mentioned as fourteen hundred The latter is a Hindi work and deals with their lives historically but without going deep into the controversial points and with their works very briefly. I have, therefore, tried to collect first hand information from the sources available in various libraries, and sought, to the best of my ability, to give a consolidated account of the problems such as the nativity the childhood and the parentage of the brothers, the identity of Vidyarany a with Madhavacary a and also Sankarananda with Sri Vidyatlrtha, the contrast between Madhavacary a and Madhava Mantrin, the conversion of Harihara and Bukka, the distinction of the roles of Vidyarauya and Bharatitlrtha etc. I have shown, too the untenability of the arguments of Prof. R. Rama Rao and Prof P. D. Desai against the identity theory and the origin' of the founders of Vijayanagara respectively. I have also given the etymological derivations of the names of Sayana and Vidyaranya. 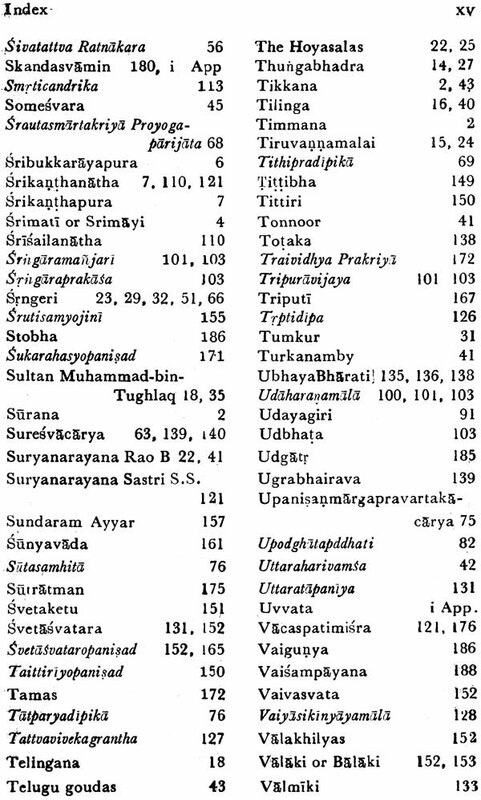 There are a large number of books and inscriptions describing the life and achievements of Sayana and Madhava – Vidyaranya. The city of Vijayanagara, which was an abode of Hindu culture and under the patronage of Harihara and Bukka, gave a fillip to the revival of Vedic culture i all its bearings. Vijayanagara became the centre of all the cultural and literary activities. Whether they (Sayana and Madhava – Vidyaranya) were Andhra Brahmins or Karnataka Brahmins is made a prestige issue by modern scholars belonging to the two regions, each claiming that the scholars belong to their own state. Vijayanagara being a bilingual area, there is every possibility for the people to be accustomed to mutual adoption of the culture and the civilization of booth the states. This bilingual nature of the city might be the reasonfor the scholars to doubt whether Sayana and Madhava – Vidyaranya were Andhra Brahmins or Karnataka Brahmins. There are two words in Telugu 'Sayamu' and 'Anna", The first word means help and the second word is an honorific epithet t Sresthavacaka) when employed at the end of the nouns to denote persons expresses honour or simply means brother. The above two words by undergoing prescribed grammatical operation (Lopasca Vibhaktyadeh sabdesu syat samasakangesu, Sabda Cintamani - halantapariccheda, 45) constitute the compound word 'Sayana' or 'Sayanna.' But where there is cerebral sound in the name of 'Sayana', it can be recognized to have taken place, by the influence of Kannada or Tamil or by the analogy of some word like lavana which contains a cerebral sound. 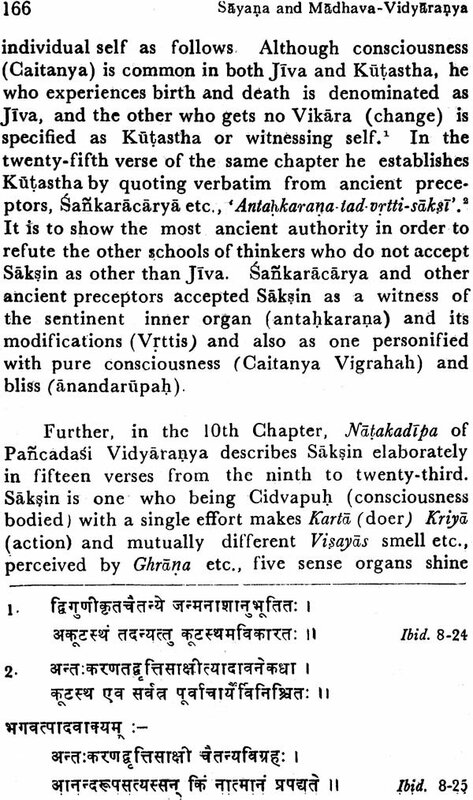 Sanskritic etymology of the word 'SayaJ)a' is also given in the foot-note', which in English means he who. avoiding doubts, decides or brings the meaning of Veda to light. Further, the same word 'Sayamu' to which if the word 'Amma' or 'Ama' is added becomes a compound word -Sayarnma' or 'Sayama' and denotes generally the name of a female person. 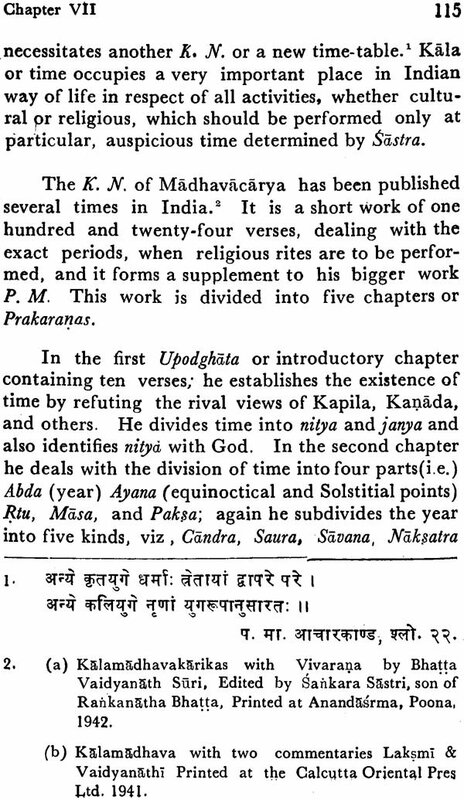 Another evidence is that Ahobalapandita, who was obviously a native of Vinukonda in Guntur District, in his introduction to his work Ahobalapanditiya, a commentary on 'Sabdacinuimani of Nannaya, an authorititative grammar of the Telugu language, mentions that he was the nephew of the same person Madhavacarya who was Sayana's elder brother and who became Vidyaranya after taking Sannyasa and that he received his education from him only. 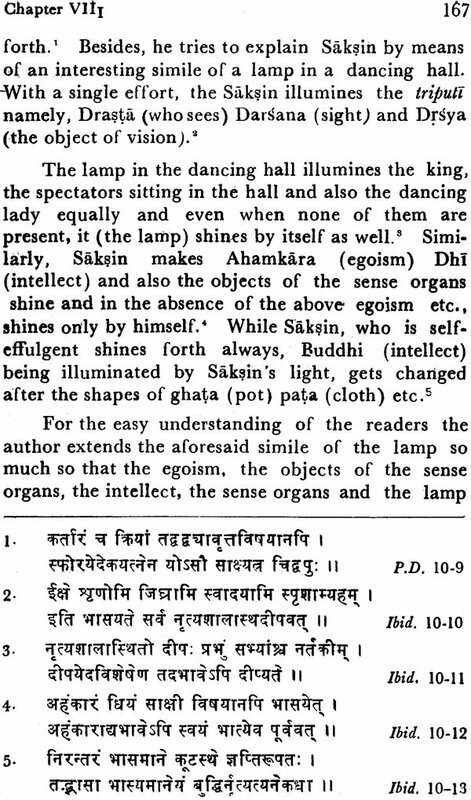 In addition to this, there is another authentic document cited by Baladeva Upadhyaya in his Hindi work Acarya Sayan our Madhao that Sayana himself wrote "Asmakam Andhranam" which means "to us Andhras".' 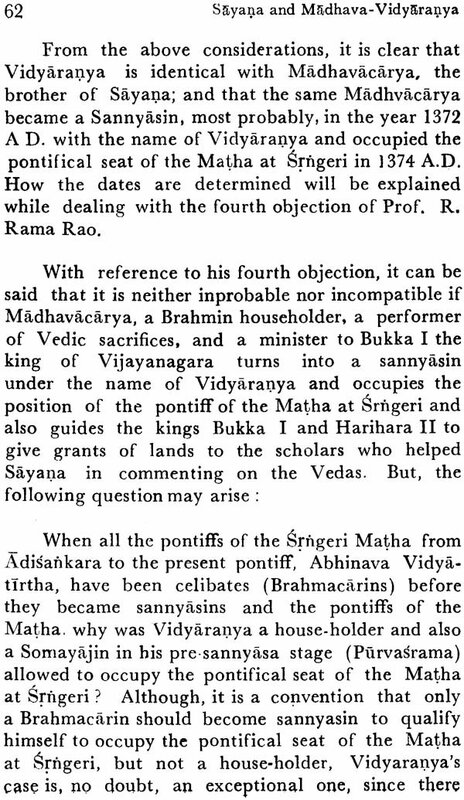 Another evidence is that V. Venkatasivavadhani, quoting the opinions of Burnell and others, states that Madhavacarya- Vidyaranya is a Te1ugu Brahmin. Lastly, Kona Venkataraya Sarma, the author of a Telugu work dealing with generals, writes that Sayana was a Telugu Karana Kamma Niyogi Brahmin ! This sect exists only in Telugu nadu or Andhra Pradesh. In view of the above-mentioned facts, it is quite reasonable to conclude that they were Andharas. Mayana was Sayana's father and was known as a minister of Sangama, a petty king related to Yadava clan who ruled a small area with capital city of Mangalanilaya, the present Mangalagiri on the southern back of the river Krishnaveni. 'Srimati was his mother's name and is mentioned in may places; but a stone slab of the temple of Arulal Perumal at Kanchi or Kanjeevaram speaks of her name as Srimayi. It is probable that Silmayi was her original name and Srimati the Sanskritized form. Sayana's eldest brother was Madhavacarya the great scholar, the outstanding statesman, the Prime Minister of Harihara and the mighty protector of Vedic Religion. His youngest brother Bhoganatha was an accomplished poet and flourished in the Court of Sangama II. Sayana's sister Singale (Srikala might be the Sanskritized form) married Ramarasa, a Karnatka Brahmin and gave birth to a son called Laksmidhara. But Ahobalapandita, who was known as the nephew of Madhavacarya – Vidyaranya might have another son of Singale. Here the following point deserves to be noted. Ahobalapandita, in the introduction to his commentary on Sabdacintamani a grammatical work of Nanaya, mentioned only his uncle's name as Madhavacarya-Vidyaranya and passed him at length but he did not mention even no mention of him father and mother in his over the following fact. He must mentioned and paid his homage to his father and mother in at least one verse, but the later grammarians like Ramachandra who after two hundred years of the death of Ahobalapandita, copied it might have purposefully eliminated the verses. 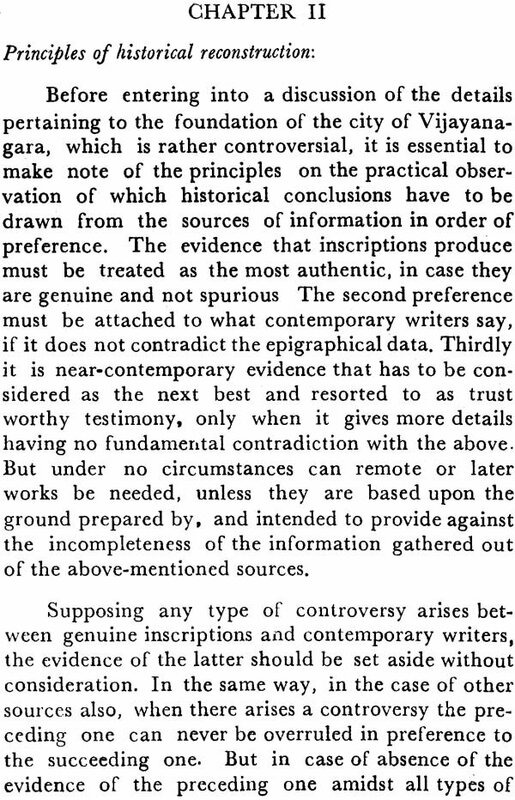 It seems to be their purpose that they wanted not only to copy it but also to make the grammar fullfledged by way of interpolating a number of linking prose passages and the number of verses composed by the poets even of 17th century for the purpose of illustrations.